Thanks to "Toyota Service Advantage" capped price servicing, you don't have to worry about unexpected and astronomical service costs. When you buy a brand new Toyota, you'll pay the same low price from one service to the next. The pricing is capped so you'll pay no more from one logbook service to the next for a minimum of the first three years or 60,000km*, whichever comes first. If you're not sure if your Toyota is eligible for Capped Price Servicing - click here. Please have your VIN number handy. 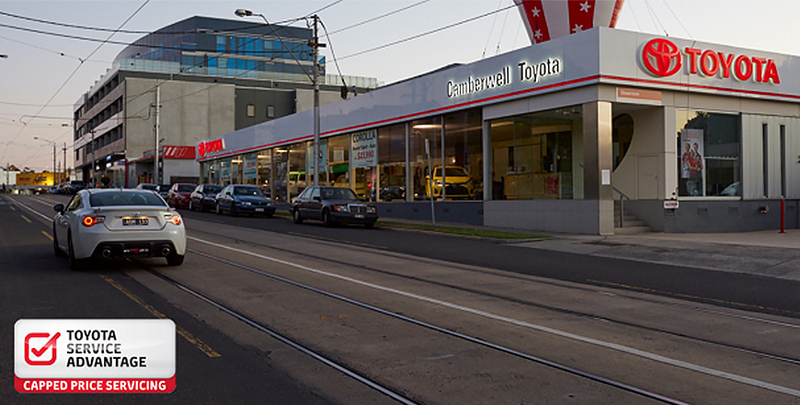 Not all Toyota Service Centres are able to provide all services as listed above. Please ensure you contact your local Toyota Service Centre to confirm their services prior to your visit. Maximum payable for standard scheduled servicing (normal operating conditions). Excludes Goverment, Rental, Fleet Not for Profit and Toyota Employee Family Vehicle Purchase vehicles. Contact your Toyota Dealer or go to toyota.com.au/advantage for other exclusions and eligibility. Please note the first service may be claimed from one month after registration of warranty. However to claim this service at this time Camry, Hybrid Camry, Aurion and 86 must have travelled the recommended 15,000km and all other vehicles the recommended 10,000km.